I have spent a lot of time mentally preparing for Ironman Boulder these last few weeks…reading about mental training, visualization, mantras, positive self talk, etc. Carrie Cheadle’s most recent article in Training Peaks…5 Simple Strategies for Overcoming Race Day Nerves…has a lot of great focus points for race day. 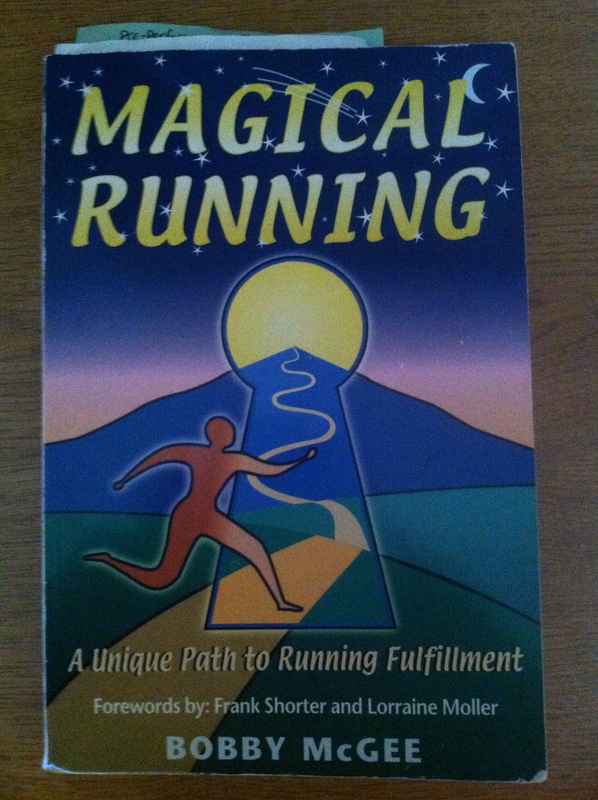 She also has the book On Top of Your Game that I have read and have found VERY helpful for mental training. I’ve decided to take you inside my mental training and let you “see” what I see and “hear” what I hear. Think Gold and Don’t Settle for Silver! I am strong. I am tough. This should hurt, but it will go away. Embrace it! Do you do mental training as part of your pre-race training? If so, what additional mental training components do you incorporate into your training? When we signed up for Ironman Boulder, we knew we wanted to take a few weeks vacation before the race to acclimate to the altitude and arid climate. Thankfully we were lucky to get to spend 3 weeks in Colorado acclimating and catching up with family and friends. The first part of our trication (vacation with a triathlon) is at Red Feather Lakes, Colorado (elevation 8,600 feet). We loaded our Rav4 on Friday evening so we could leave bright and early Saturday morning. The inside of the Rav4…minus 3 Ironman athletes. All of our clothes and luggage were stowed outside of the vehicle. My co-pilot and navigator are sleeping. We eventually made our way to Cheyenne, Wyoming after traveling through Nebraska (AKA…The. Most. Boring. State. EVER! ), where we loaded up on groceries and gas before making the final 2 hour trek up into the mountains. As we crossed the border into Colorado, it started to rain on us again, but thankfully it didn’t last. We got a bit wet as we entered Colorado again. We arrived at our friend’s home in Red Feather Lakes at about 4:15 pm (mountain time), unloaded our vehicle, had great conversations with Kuby (our friend whom we stayed with), went for a walk down to the lake and enjoyed some amazing homemade Bolivian cuisine. We are staying in a BEAUTIFUL home!! The view off of the deck overlooking the lake. I woke up at 3:40 am (mountain time) and made myself go back to bed before getting up at 5:30 am and spending some quiet time on outdoor deck in the sun. It was 49F and ABSOLUTELY BEAUTIFUL!! The morning sunrise on the mountains. Drinking my Karma Kombucha on the deck watching the sunrise. We made some breakfast and then I went back to bed for a 2 hour nap. These first few days at altitude are all about resting and acclimating to altitude without getting altitude sickness. I spent some time working on my blog posts, catching up on other blogs that I follow and playing cribbage with the Iron Hippie in the afternoon. Kuby is an AMAZING cook!! We were able to enjoy another AMAZING meal…this time Turkish cuisine. After breakfast, the Iron Hippie, Allen and I loaded into the boat and cruised around the lake before the winds really started to pick up. Allen, the Iron Hippie and me on the water. Growing up on the lake, I had the most experience driving the boat. The Iron Hippie and Allen are enjoying the view. After being chilled on our boat ride, we decided it was time to get in the hot tub. After lunch, I went down to the lake and read by the dam. It was so peaceful and I actually got a bit warm sitting in the sun. The bald eagle was soaring above me while I was reading. It was our night to cook…Thai food, here we come!! Most of our late afternoon was spent prepping food for the meal. I started my day with some pre race planning and mental training, while sitting in the sun on the deck. What a beautiful morning and the perfect way to start the day!! After breakfast, I continued to bask in the sun and read books until lunch. 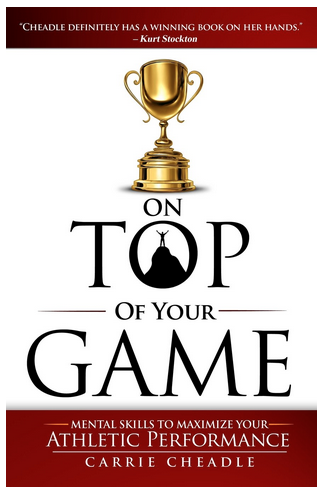 I finished On Top of Your Game by Carrie Cheadle and started reading The Champion’s Mind by Jim Afremow. We prepped food for dinner…nothing to extravagant tonight…roast, potatoes, carrots and onion. Simple and tasty. My afternoon was spent doing some laundry and repacking my bag and our cosmetics so I was prepared to head to Estes Park on Wednesday morning. Everything is all packed up and ready to go to Estes Park. After dinner, we went for one final walk around the Red Feather Lakes area before hitting the sack. A moose on the side of the road. The boys checking out the lake one last time before we leave. 3 little ducks had to hop up the dam to swim away. Suehiro was an AMAZING sushi bar! Thanks to Kuby for the suggestion!! Mick treated us well with amazing food and conversation…he definitely has the Midwest hospitality (he is from Minnesota after all)!! This was an AMAZING fish casserole and two rolls that Mick picked out. These three rolls Mick picked out and he flame kissed them with a blow torch! We then headed to the Ironman Boulder bike course and drove the route to get an idea of the course as well as the turns we would be making for some pre-race riding we had planned later in the week. After finally arriving in Estes Park, we unloaded the car and I spent some time organizing my room before finding a nice place for dinner and settling in for the evening. We made it to Estes Park!! This is our cabin for the duration of our stay in Estes Park. This is the view from our patio for the next 11 days. My own personal room for the next 11 days…I get a break from the testosterone!! A stream that runs through Estes Park’s downtown area. Waiting for our table at Poppy’s…enjoying the quiet of the stream and the band off to my left. This was my Mediterranean Pizza…Yummy!! Salt water taffy for dessert…SWEEEET!! Have you ever been on a trication/racecation? If so, where did you go? How did you get your training in while traveling? Balance…trying to balance a 40 hour work week with ~20 hours of training and still find time for friends, house chores, dog snuggles and the little things in life is a challenge, but it is all worth it!! I’ve noticed that I am so much more efficient and productive during these busy weeks. I also eat healthier and sleep better. During recovery weeks, I tend to skip more workouts; the pressure isn’t high enough during recovery weeks, so I am not as efficient and productive elsewhere in my life. With my Sole Sister…we do work together and see each other everyday, but we haven’t had a workout together in a LONG time and we haven’t had a conversation that wasn’t work related in even longer. I miss her and am in need of some #solesistalove and #solesistasweat REALLY soon!! Warmer weather, fresh air and sunshine…I am definitely loving outdoor workouts and am getting excited to do some landscaping in the backyard. With 20+ hours of training in each of the next couple of weeks, I’m hoping for less rain and more sun to get out and soak up even more vitamin D!! I met with Coach Julie in early November to discuss my 2014 racing calendar. We discussed many topics, but I am putting some of the highlights out for the public to help hold me accountable during 2014. 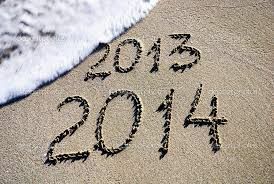 What are your goals and wishes for 2014??? I was inspired by Carrie Cheadle’s Facebook Post about giving yourself something to make you feel amazing for the 12 days of Christmas this year. I decided to give myself a “gift” everyday during the 12 days of Christmas….some of these gifts were what Carrie suggested, while others where ones that I came up with on my own. Each of these gifts is special to me…some of these gifts are very simple and most of them don’t cost even a penny, but they are all gifts we should consider giving ourselves everyday to remind ourselves just how special we truly are. 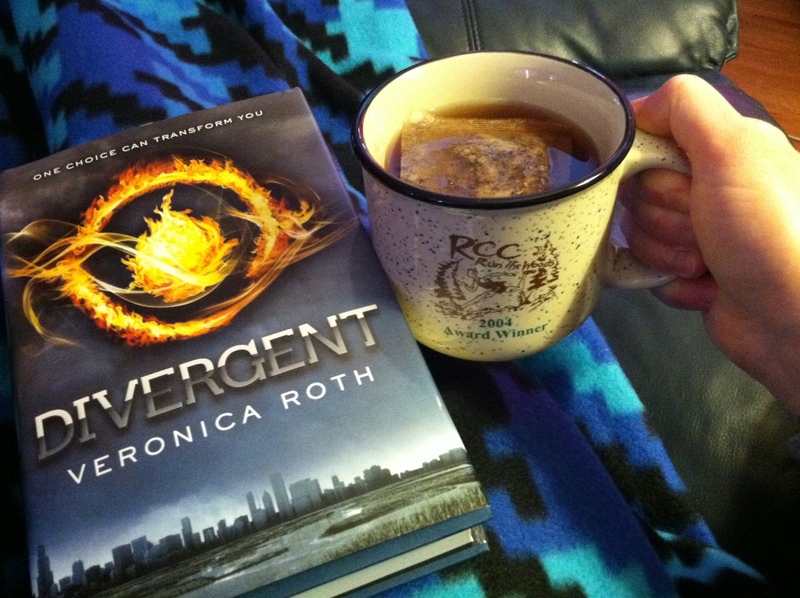 Taking 30 minutes to snuggle up under a cozy blanket with a good book and a cup of hot tea (in a mug I won as an award in 2004 at RCC Run the Woods). 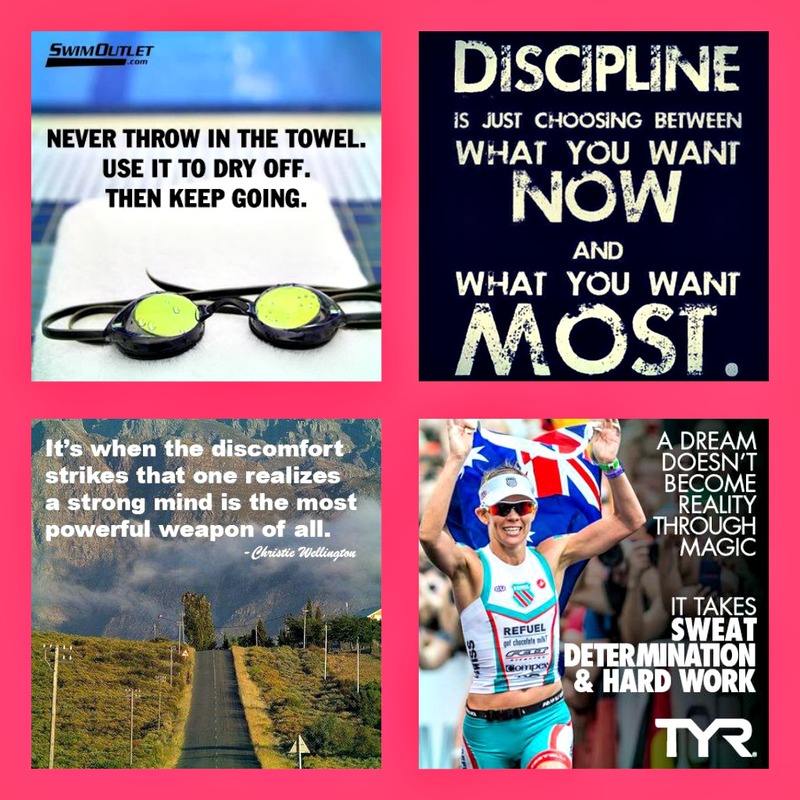 Day #3: Gift of Motivation…I decided to make a motivational collage and post it where I can see it daily. Day #4: Give myself a pat on the back…I don’t give myself enough credit most of the time for all that I do and how amazing I am. I decided a good pat on the back was in order. 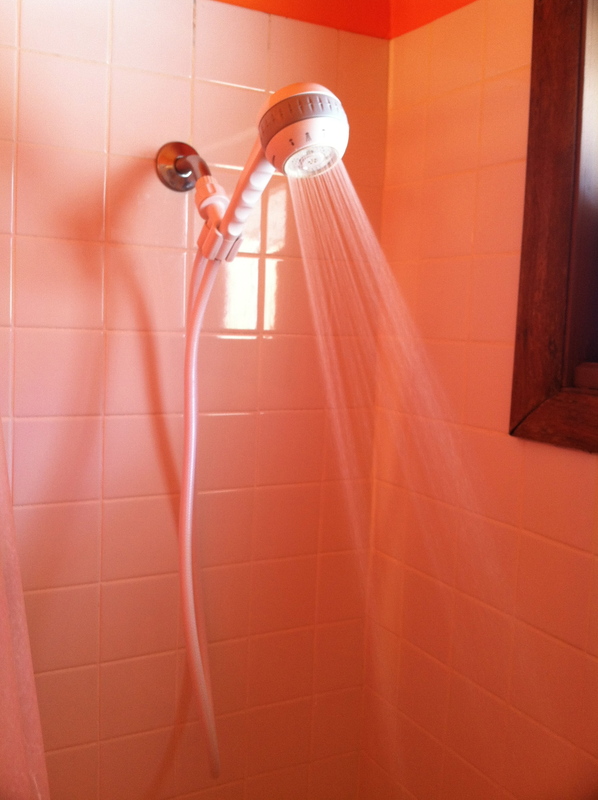 Yes…a shower. While this may seem too simple for most of you, I was incapacitated for a week due to a combination of strep throat, a severe sinus infection and pneumonia, so a shower felt truly amazing!! It was a small gift, but the best gift I could ask for at the time. Day #6: I gave myself an award. Since I ended my 2013 triathlon season with a DNF, I decided with the New Year just around the corner that it is time to start mental training for 2014. 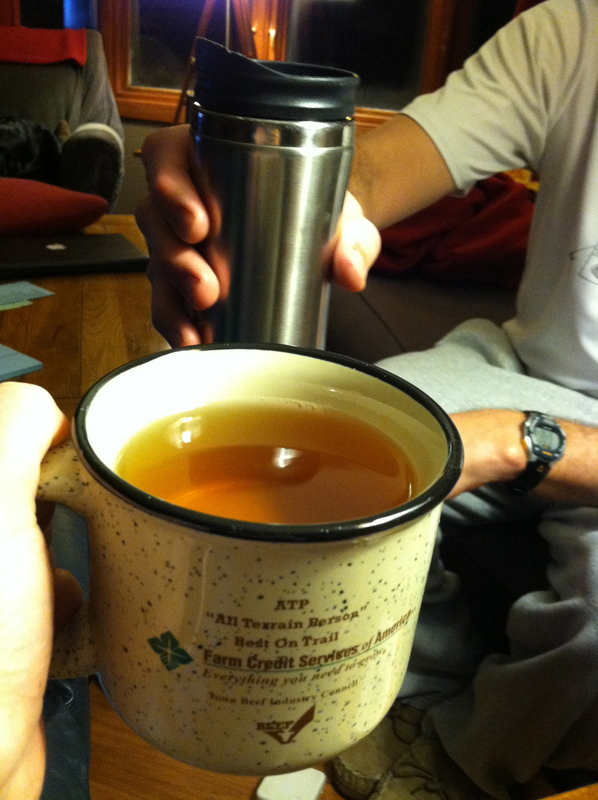 Day #7: I gave myself a party…not the typical party with lots of people, food and drink, etc. I gave myself a party with just me and my girls (Mya and Basil…our two black labs). I played the song “Celebration” by Kool & The Gang, we danced, celebrated (both feeling better and the beginning of a 2 week winter break), smiled and had lots of fun!! 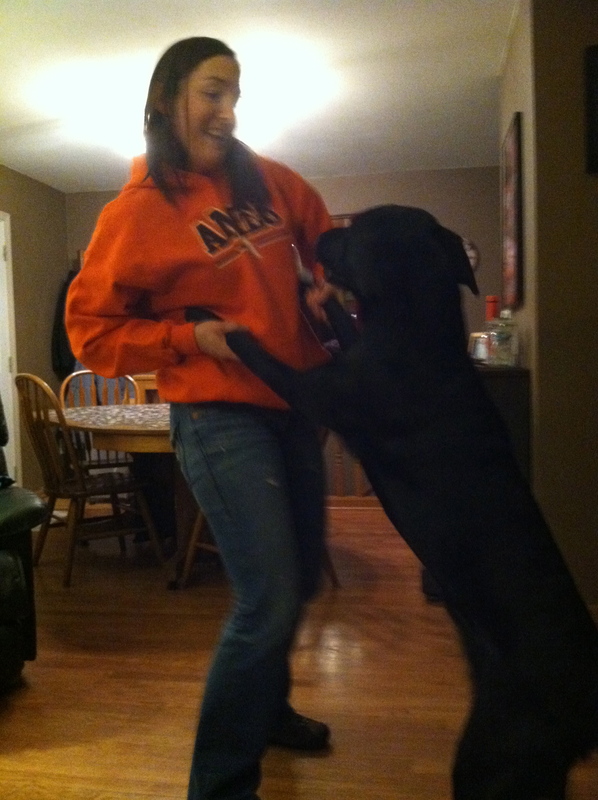 Basil dancing with me and celebrating!! Day #8: Gift of Knowledge…I purchased a book to help me learn how to perform better under pressure, tame the butterflies and overcome setbacks. 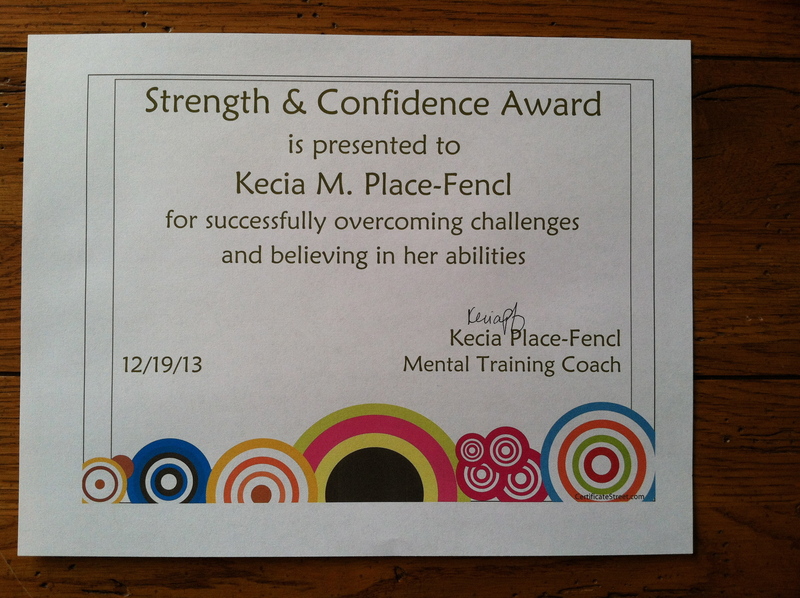 I am hoping to use these mental skills to help me perform consistently, remain confident when faced with challenges and successfully accomplish my goals both during training and on race day. 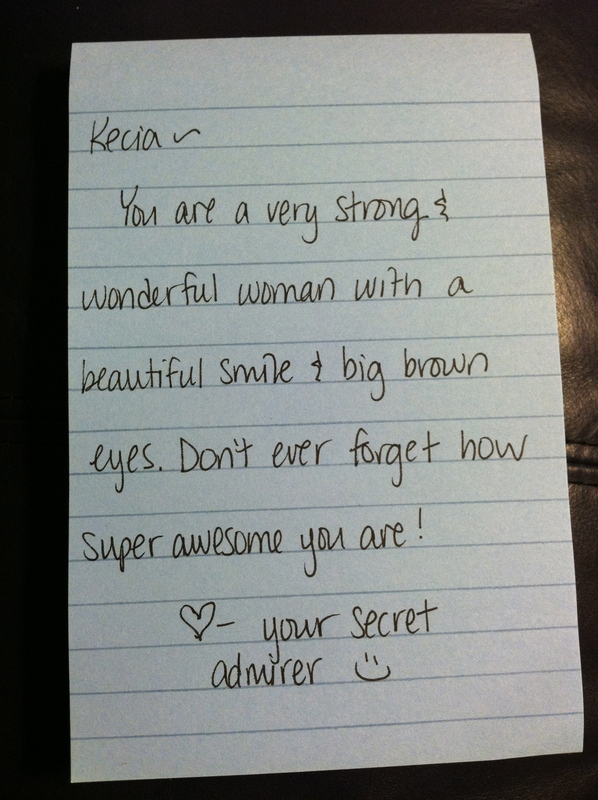 Day #9: Gift of Perspective…a list of gratitude. 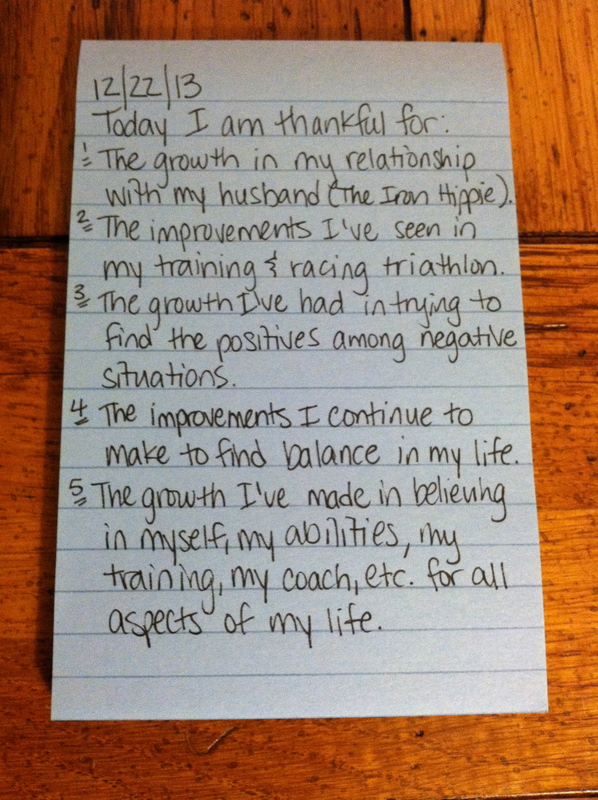 I make a list of things I am thankful for every night before bed, but I decided to put a twist on this list…growth is a must for everything on this list. 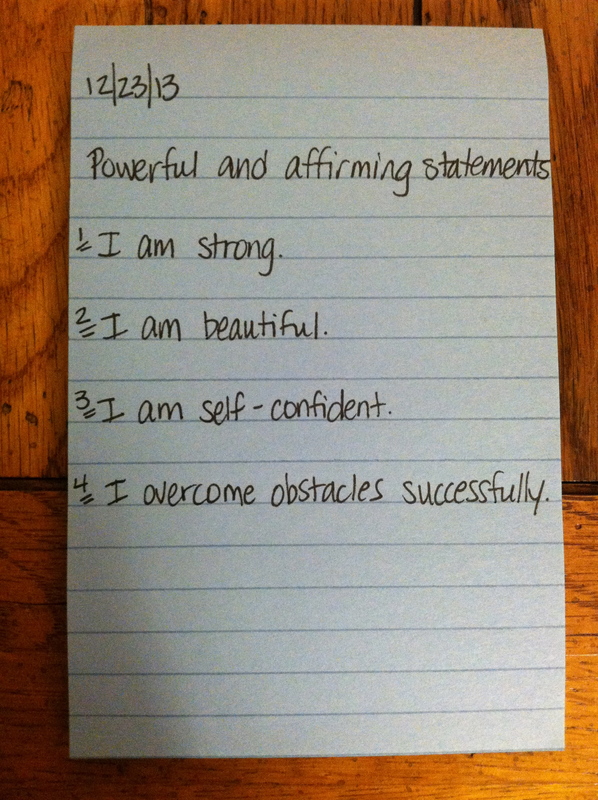 Day #10: Gift of Encouragement…I wrote out 4 powerful and affirming statements and posted them where I will read them everyday between now and January 1, 2014. The power of being who I want to be lies in my own thoughts. Only I can change negative thoughts into positive beliefs. Day #11: Gift of a Toast to Celebrate ME…”I proposed a toast to my strengths, my PRs in 2013, my commitments and dedication.” I also “proposed a toast to the most relaxing Christmas ever” with the Iron Hippie. 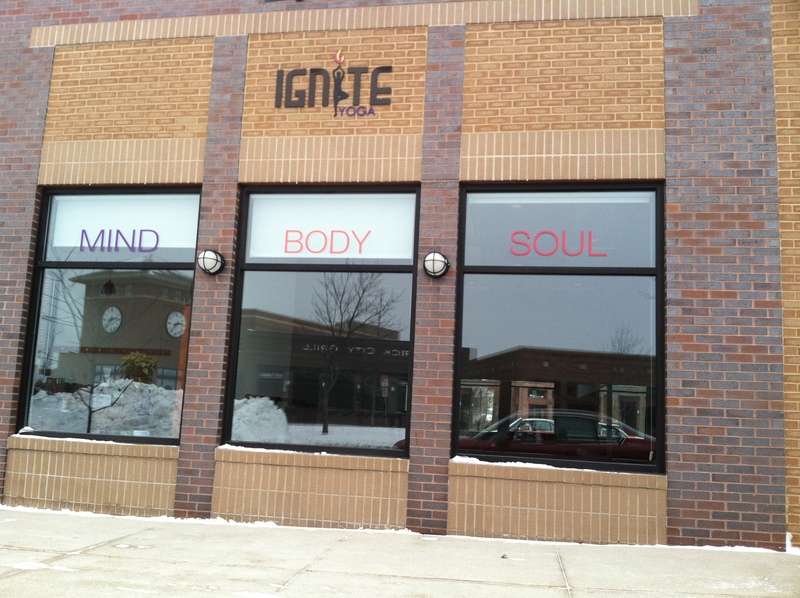 Day #12: Gift of Relaxation…I started Christmas morning with 1 hour of hot yoga. While this is typically in my weekly workout routine, I haven’t been able to workout for the last two weeks due to illness. I decided that this would be a perfect gift for Christmas Day. Starting Christmas Day focusing on Mind, Body and Soul…PERFECT!! 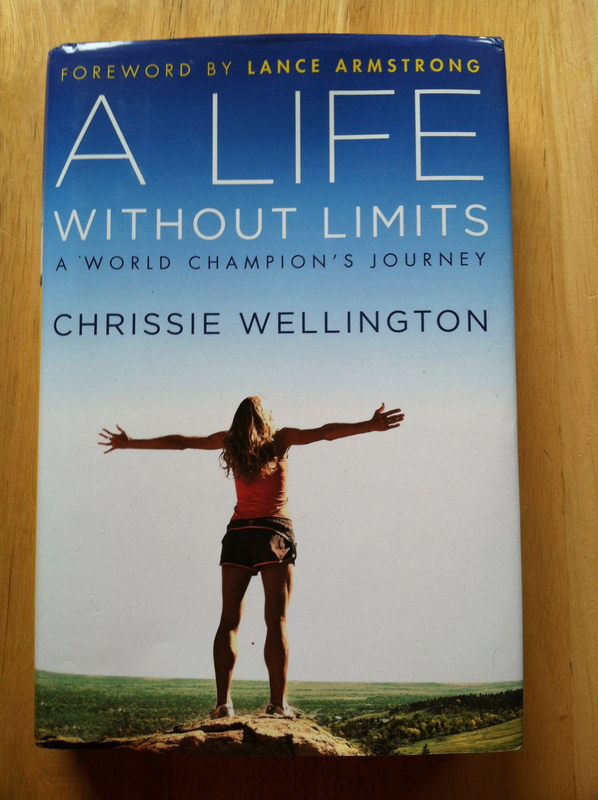 “A Life Without Limits” by Chrissie Wellington…I have actually read this book twice. I love that Chrissie does not just tell us about her life as a professional triathlete, but also tells us about her life growing up, her family, her friends, her education, her life experiences, how she overcame challenges with eating disorders, her career evolution, vacations she ventured on and the route she took to become a professional triathlete and the Queen of Ironman. “Can’t Swim, Ride, Run: From Common Man to Ironman” by Andy Holgate…One of Andy’s colleagues challenged Andy to complete a triathlon. This challenge would change his life!! He not only had to learn to swim and bike, but he was also engaged and accidentally signed up to participate in his first Ironman seven days before his wedding. 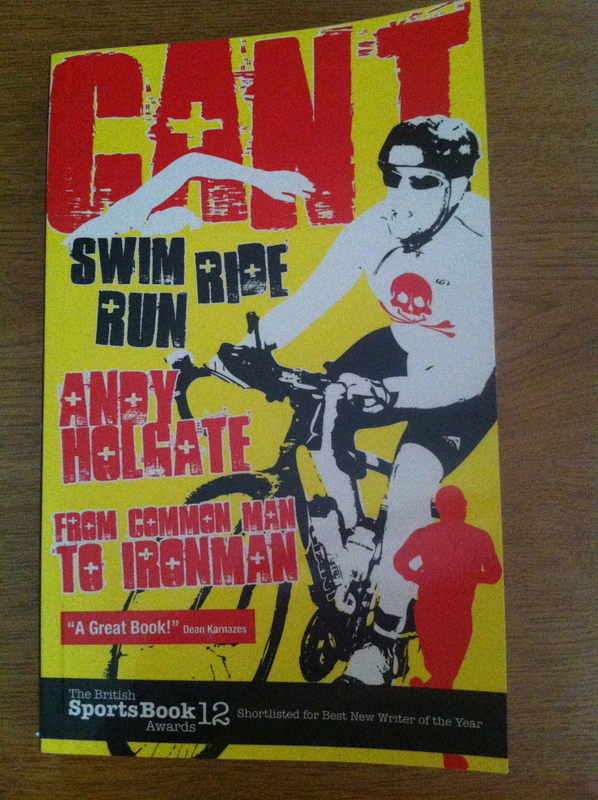 This book is about Andy’s journey to his first Ironman, with a little emphasis on preparing for his wedding day. 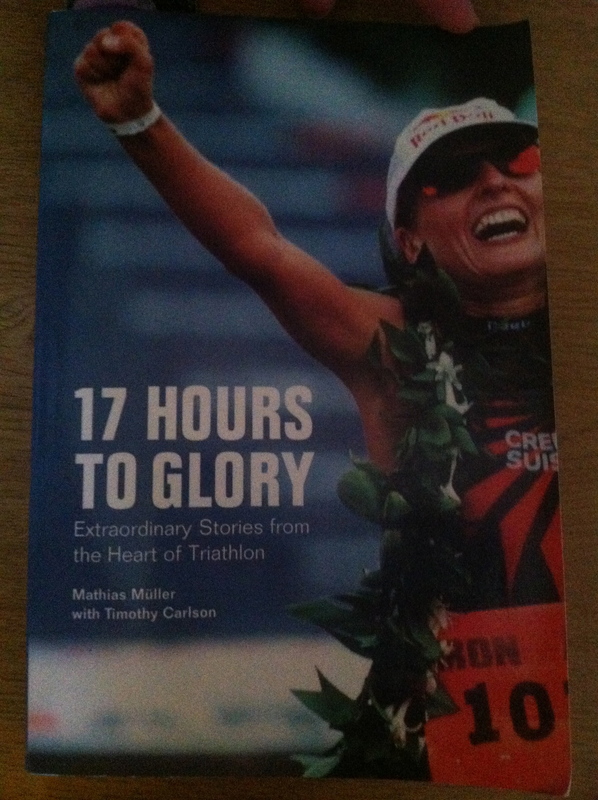 “17 Hours to Glory: Extraordinary Stories from the Heart of Triathlon” by Mathias Muller with Timothy Carlson…This book is a compilation of a variety of different triathlete’s journeys to and through Ironman competitions. These journeys include those of professionals, age group athletes, wheelchair athletes and physically challenged athletes. Each chapter is dedicated to an individual that has their own story to tell, which is told in their own, unique voice.